MSE Creative Consulting Blog: Book Review: "Disasters & Climate Change"
To many, especially those that read about global warming in the media, my insistence that disasters have not increased in the global warming era seems odd, to say the least. There are two reasons my position does not track media reporting. The first is that the media reports "science by press release" rather than the actual content of scientific publications. Press releases usually emphasize the sensational aspects of a paper in order to get press coverage. So, it is a never-ending cycle of disaster hype. The second reason is that, as a meteorologist, I try to keep up with the actual science. In that regard, I just finished a great book that reaffirms that disasters have not increased. The dysfunctional nature of climate science with regard to attribution of global warming and increased disasters. There is high confidence that global warming has driven daily extreme high temperatures to more frequent occurrences. It is "likely" (i.e., better than 50/50) that some parts of the world are observing more rainfall due to climate change. One of those areas is Central North America. If true (and, it may be), that is a good thing! But, even though some areas may be receiving more rainfall, "there is very little evidence to suggest that these increases have been accompanied by increasing floods." I completely agree with Roger's conclusion. There is virtually no reliable evidence that floods are increasing. The implications of this are huge: America is the breadbasket of the world. More rain (and, longer growing seasons due to a warmer climate) without additional floods means more food production for a hungry world. US hurricane intensity is decreasing. The US is in the longest "drought" of major hurricanes in more than 200 years. We have not had a major hurricane in nearly 11 years. Page 70 says there is no discernible trend in worldwide hurricanes. There is no indication tornadoes are increasing. Note from me: The graph in the posting below shows major US tornadoes are decreasing. For more than a quarter-century, we have been hearing about supposed doom from worsening disasters due to global warming. They haven't occurred in spite of humanity harmlessly passing literally dozens of "tipping points." Roger recommends decarbonizing energy production, especially by finding new sources of inexpensive energy that are very low or no carbon. He correctly cautions that we cannot know for sure that additional CO2 in the future might cause disasters to increase. I am less enthusiastic about decarbonization because of the delay in bringing affordable energy to extreme poverty areas of the third world. I also believe additional greenhouse gases are a form of insurance against global cooling which would be catastrophic for mankind. However, that is a debate where reasonable people can disagree. Roger's book is quite readable to the non-scientist and I highly recommend it. 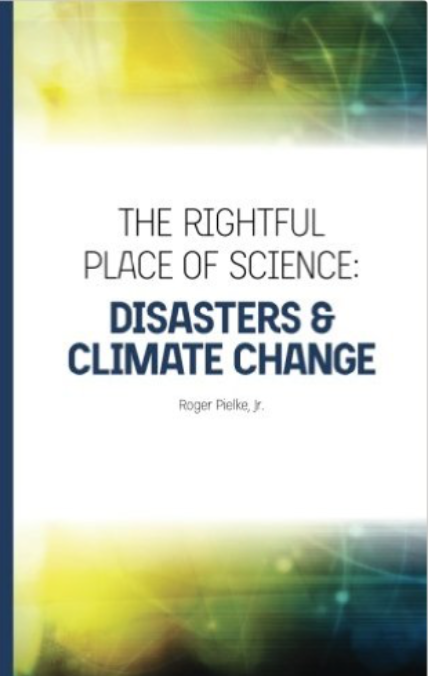 It's an excellent, short, crisp book on climate change that describes the consensus science and provides extensive examples of what is said on this aspect of climate change.